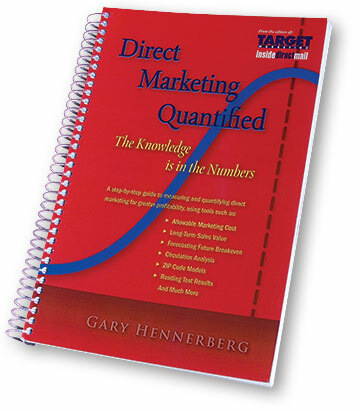 As we enter the critical make-or-break fourth quarter, and you begin your 2014 direct marketing budget plans, you will likely be faced with many marketing decisions which is today's blog at Target Marketing Magazine. Those decisions are usually needed quickly. But often they’re not made quickly. Whether its information overload from so many options, analysis paralysis, or managers who are afraid to make a decision, today we explore five ways to make marketing decisions quicker and more confidently. A mere generation ago, direct marketing decisions were limited to direct mail customer file or rented lists, space ads in magazines, package inserts, direct response broadcast and a few other media options. Fast forward to now, and the direct marketing decision landscape has grown exponentially with online and cross-promotional media options. Every season reveals new, unexplored online opportunities. Some are fads. Some turn out to have real value. So for your direct marketing budget planning, here are five recommendations of how to evaluate opportunities and make decisions more quickly and confidently. 1. Cost per response. An important metric for most direct marketers is the marketing cost per response (per lead, inquiry, sale—whatever your situation). This core metric may be your most significant contributor to your decisions. 3. Summarize results in a matrix: Placing your data in spreadsheet will put the numbers in front of you so you can see all your activity in one place. You may want the data by media type on separate spreadsheet tabs so you can see more granular data. For example, on one tab you summarize results from direct mail (by list, or summed up by customer vs. rented lists) with cost per response. If you allocated unknown orders, be sure to include those. Another tab might concern email results that summarize opens, clicks, conversions and cost per response. Other tabs could summarize pay-per-click, social media, retargeting or whatever media you are using. Then roll up and summarize all of the media on a tab of its own. If cost per response is most important to you, then sort the data from the lowest cost per response to highest. Perhaps you have “soft data” that will be a factor in your decisions. If so, add columns to enable a written evaluation of each. Maybe your evaluation is as simple as “pluses” and “minuses” for each opportunity. 4. Parameters for Decisions: It happens all the time. With so many choices and options, and potentially several staff members wanting their piece of the budget, decisions can be contentious and slow. When that happens, everyone loses. When you establish the parameters for decision making upfront, it’s easier to slice the pie into the right proportions. More importantly, if the head of the organization or department has established those parameters in writing (avoid verbal direction to avoid future misunderstanding), staff is empowered to make more confident decisions without delay. 5. Don’t forget test budgets. Know, ahead of time, how much money you can gamble in a test. You should view the money spent as having zero return so that when if it works you’re pleasantly surprised. A rule of thumb you might use is to allocate 10 percent of a total marketing budget to tests. Whether it’s a direct mail list test, or new online media, the only way you can learn if those options work for you is to test it. Remember, too, that marketing fads can fizzle quickly. The hot new opportunity of 2012—not even a full year ago—may already be a distant memory. If you have processes, or recommendations, about how you make faster, more confident marketing decisions, please share them in the comments area below.